Our previous article talked about 2 catchers mitts that are top of the line. Today, we have brought together a list of another 7 best catchers mitts for 2019 season. 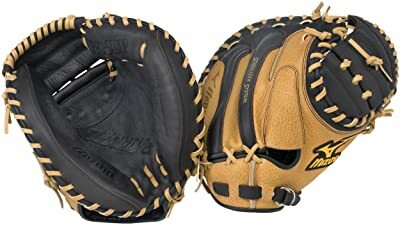 We have shortlisted these mitts after some rigorous research and by reviewing a lot of baseball catchers gloves currently available on the market. Included in this list are 2 best youth catchers mitts as well. Read the reviews for all the shortlisted mitts below to find your best pick. Nokona is known for producing some of the best catcher’s mitts on the market. The XE Elite Series of the company is particularly known for offering various position-specific mitts for baseball players. Of these, the X2-3000 is specifically geared at the catchers. 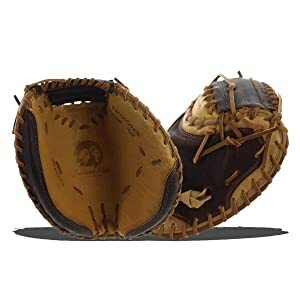 This catchers mitt has been constructed using high-quality Stampede Steerhide combined with Kangaroo Leather and a specially designed padding system made from Nolera Composite. These materials combine to give this mitt its trademark flexible and comfortable feel. X2-3300 delivers an exceptional degree of quality, performance and comfort. A distinct feature of this mitt is that it has virtually no break-in period. Nokona claims that this mitt is ready for use right-off-the-shelf. This means that you don’t have to spend any time on breaking it in. Instead, you can take it to the field right after unpacking it. The X2-3300 is handcrafted with a meticulous attention to detail. The mitt is available for right-handed players. It is sized at 33.5-inch and comes with an adjustable strap which allows for nearly 1 inch of size adjustment. The glove features a closed web and open back design for maximum maneuverability for the catchers. X2-3300 is the perfect choice for catchers who are looking for the best stuff that delivers great quality, reliable performance and a comfortable design. Shoeless Joe Gloves mitts are the hallmark of class, style and performance. 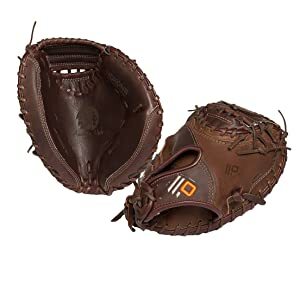 The mitt offered by the company features that classic look and feel while delivering a performance that is head and shoulders above the competition. This catchers mitt from Shoeless Joe Gloves comes manufactured entirely from 100% cowhide. The company uses its trademark process to tan the mitt using Antique Tobacco Tanning Process which gives this mitt its iconic feel. To top it, the mitt is then hand-rubbed with old-time ingredients which bring out its classic game-worn look. At the same time, it makes the glove ready for play right away. This means that like the X2-3300 mitt above, this mitt doesn’t require any break-in period. You can start using it for play right after taking off the wraps. A rather unique feature offered by the company with this mitt is that you can have it ‘serviced’ any time you want. The company offers a very affordable leather reconditioning program. Through this program, you can have the mitt serviced so that it looks and feels new. All-Star offers some of the best-performing baseball mitts. This is true for catchers mitts as well. The company has a reputation for offering mitts that are designed to offer a very custom fit and deliver a solid performance. The Adult Pro Elite Catchers Mitt is an example in this regard. All-Star has used high-quality Japanese tanned steer hide in constructing this mitt. This allows you to break in the glove in an exceptionally brief period while offering excellent durability in the long-run. Inside the mitt, All Star has used a soft tan leather pocket. This pocket offers a comfortable feel for the wearer and lets off that classic pop when the catchers snag the ball. On the back, an adequate amount of support is added to allow catchers to handle the ball easily. All-Star has designed the mitt’s back with a locking tab design. This design allows catchers to adjust the mitt easily while eliminating any extra bulk in its profile. This mitt is available for right-handed players and is worn on the left hand. It has a comparatively steep price tag but that’s because All-Star’s mitts are definitely the best in the league. 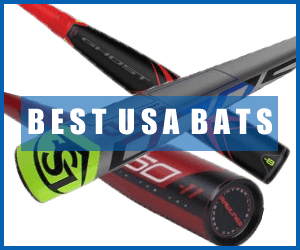 Mizuno is known for producing world-class baseball equipment. This reputation of the company extends to its baseball mitts as well. The GXC75 World Win Adult Pro catchers mitt from Mizuno features the hallmark quality of the company’s products. The company has used tanned retro leather in the construction of this mitt. This gives the mitts its soft, supple and comfortable feel. It also enables catchers to break in the glove rapidly and have it game-ready almost right away. The design of the mitt includes ParaShock finger channels. These channels support the mitt’s structure and absorb any ball-related stress or shock. 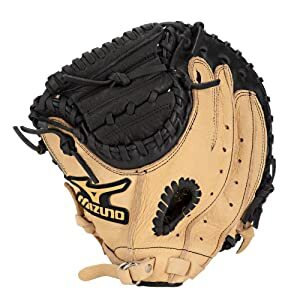 Mizuno offers this mitt for right-hand throwers so that the mitt is for wearing on the left hand. The Mizuno Prospect GXC105 is another excellent catchers mitt from the company. This mitt is specifically geared at younger players and incorporates many designs to accommodate their level of playe. For a start, the GXC105 features the trademark Power Close technology of Mizuno. This technology essentially makes it easier for the players to close the mitt as soon as they have the ball, ensuring better retention of the baseball. To further support easy closure of the mitt, the design also includes V Flex Notch. While enabling easy closure and retention in this glove, Mizuno has also kept the comfortable feel of the mitt in view. This is why the palm of the glove features ParaShock pad. The padding essentially dampens the shock of the baseball and protects the players’ hands from any fatigue, impact or injury. Here is another catcher’s mitt from Nokona. 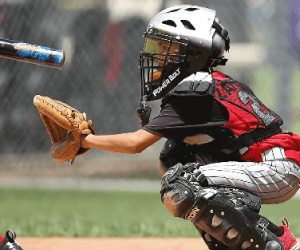 The Alpha Select S2 mitt is another youth baseball catcher’s mitt, the second in this list. Nokona has constructed this mitt using top-grain steerhide and American buffalo leather. This mitt has an exceptionally light-weight profile and offers an excellent durability. Players using it can be sure that it is going to last them many seasons in a perfectly good condition. The S2 mitt requires no break-in period. This makes it an ideal choice for travel ball as well as elite players. The mitt has a closed web and open back design for maximum comfort and good ball retention while mitigating ball-related stress. It is manufactured entirely in the USA and is available in both left-hand and right-hand models. The mitt is sized at 32 inches and is specifically oriented at younger players who want to take their game to the next level. The Sandlot Series Catcher’s Mitt from Rawlings is our final shortlisted mitt. 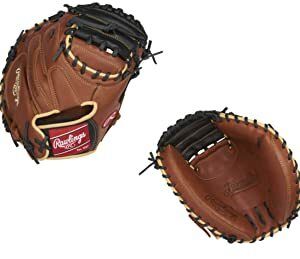 Rawlings needs no introduction as a brand – the company is globally known for manufacturing baseball bats, gloves and a wide range of other equipment. The Sandlot Series Catcher’s Mitt from the company comes constructed from high-quality pull-up leather that is oiled. This gives the mitt its iconic unique vintage look. The mitt is broken in for the most part, so players have to spend a very little time in breaking it in after purchasing it. The mitt features a comfortable and sturdy design. It has an adjustable design to make it a custom fit for the catcher’s hands. The mitt design incorporates a padded finger back lining. This lining ensures that the mitt delivers a superior performance as well as a comfortable look and feel. This glove is available for right-hand throwers. This means that the actual mitt fits on to the left hand of the catchers. Catcher’s mitts are a vital part of a catcher’s equipment. The catcher needs just the right mitt to take his game to the next level. 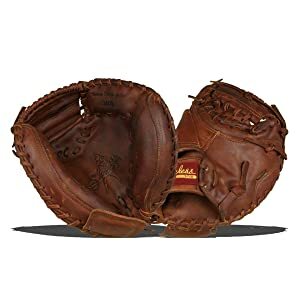 The right mitt should fit perfectly on the hand, offer good flexibility and comfort, and enable players to catch and retain the baseball effectively. 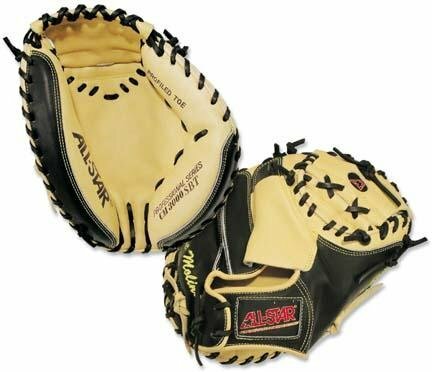 If you are not on a budget, then the All-Star catcher’s mitt listed above is the hands-down winner in the list above. However, this mitt is specifically geared at adult baseball players. Youth baseball players, on the other hand, would do well to go with the youth catcher’s mitt. These include the Nokona S2 and the Mizuno Prospects mitts listed above. When choosing the right mitt, make sure that you check out its size. Also ensure that you get the right mitt orientation – right handed players need mitts for the left hand, while the left handed players need mitts for the right hand.